Extreme Marquees has been supplying customers on the Central Coast of NSW with folding gazebos and pop up gazebos since 2003. Over recent years increased UV radiation from the sun has meant that everyone needs more protection when spending time outdoors. Our plain colour outdoor shades have a UV inhibitor that gives maximum protection from our sun. Our folding gazebo range is waterproof which is perfect should you be caught outdoors when it rains. Whether you are from Terrigal, Avoca Beach or Tuggerah Lake, if you are searching for where to buy gazebos, promotional marquees and banners or commercial branded tents, Extreme Marquees can deliver to you fast! Our gazebos are also perfect for NSW Central Coast schools, businesses and clubs that need shade for events, fairs or sporting events. Extreme Marquees has 10 imported full colour digital printers. If you need to brand your marquee on the canopy or sidewalls any design is possible. Perfect if you are attending any of the Central Coast markets with your very own market marquee. Markets have become a great way to earn extra money over the years and many of our branded custom printed gazebos and marquees can be found at the Greedy Guts Markets, Kibble Markets or at the Central Coast Scottish Spectacular. 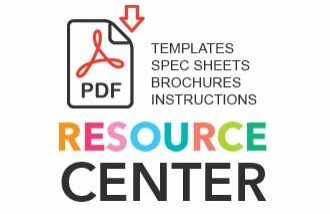 You can print as much or as little on your gazebos canopy or walls. Printing options start from just $85 for a removable printed valance. Our True Blue 2 range of marquees come with a Velcro flap on the upper side of the valance and another Velcro strip on the inside of the valance. This makes attaching a removable custom printed valance a very simple procedure. Printed tent removable valances can be changed whenever you need new signage. Extreme Marquees also supplies Ultimate Packages for those attending trade fairs and events where branding is of paramount importance. These packages include fully digitally printed roofs with a printed peak flag, a coloured anodized commercial grade aluminium Summit marquee frame and patented clip on wheels. Perfect if you are attending the “Brides Day Out” on the Central Coast or the Central Coasts annual Wedding Expo with your own market marquee. 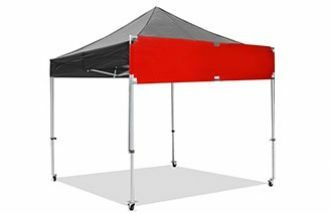 For professional exhibitors that need a more heavy duty custom printed event marquee our Arch Tent or Pavilion and Pinnacle range offer the next level up in both stability and style. Arch tents are made from an easy to assemble and lightweight aluminium frame and offers a unique appearance with ample roof area for custom signage. Awnings can be added to all sides should you need to increase the amount of shade for your display and customers. Pavilion Marquees are made from a sturdy heavy duty 63mm diameter tube. The high-pitched roof utilizes a tension cable system. The high-pitched roof makes this marquee cool inside and outside perfect for printing logos and graphics. Pavilion gazebos are suitable for any NSW Central Coast trade fair or event where style and strength are important. These event tents come in 3×3, 3×6, 4×4, 5×5 and 6×6 metre. Pinnacle event gazebos are our premium square professional tents. Made from a heavy 48x84mm leg profile these marquees offer the ultimate in both style and strength. The roof fabric is made from 800 gsm PVC with blackout fabric in-between the white PVC layers. This layer of blackout material prevents a high percentage of sun-light shining through the roof, resulting in a far cooler interior. 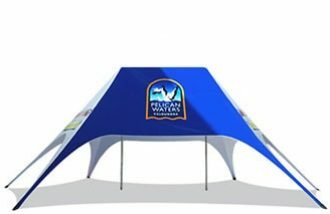 Our entire range of event gazebos can be custom printed to provide you with the ultimate Central Coast event tent. Call our office on 1300 850 832 to discuss how we can assist you in creating the ultimate branded shade solution.